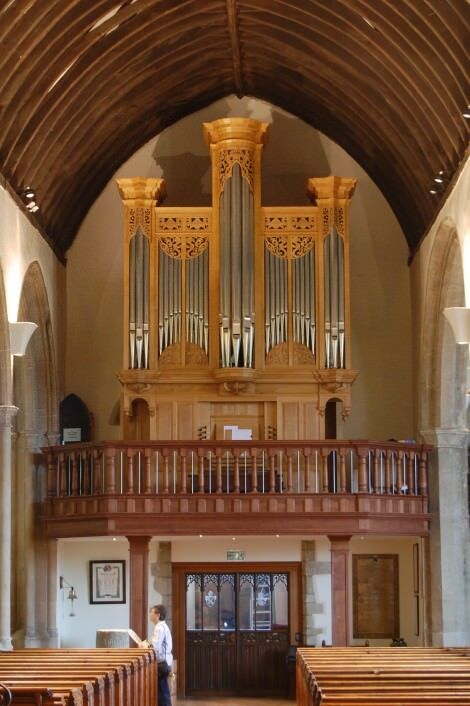 The case design is derived partly from the 1662 organ case formerly in Lincoln Cathedral (thanks to Robert Pacey who first us copies of the drawings of this case). It is intended to give an impression contemporary with the gallery (also designed and decorated in our workshop) which is in turn based on the mid-17th century galleries in the aisles on either side of the organ gallery. These were provided at the same time as the west tower which was rebuilt in the 1650s and 1660s. Keyboard compass: C – g3 56 notes. Pedal compass: C – f1 30 notes. The pedalboard is straight and concave. Combination pedals to Swell and Great: three on the left for the Swell, three on the right for the Great. The Odiham temperament is a mild well-tempered tuning system which allows all keys to be playable, but is better in the most commonly used ones. The organ was the brain child of Ian Ledsham, the organist of the church, who was tragically killed in a car accident in 2005. Tim Paton took over the organ project, and the organ is dedicated to Ian’s memory. Ian Bell and William McVicker were the organ advisors. The current Director of Music at All Saints is Jane Palmer.